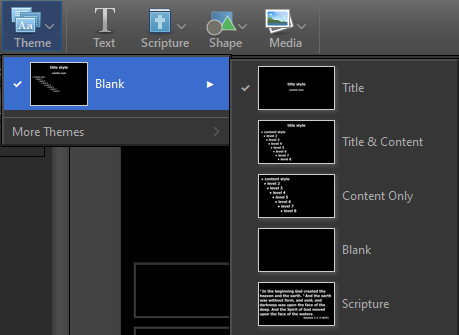 When you add a Presentation Theme, you'll notice that it has more default slides than a Song or Scripture Theme. That's because a Presentation Theme has five different types of content slides that can be added to it (e.g., Title Slide, Title and Content Slide, Content Only Slide, Blank Slide, and Scripture Slide). Editing your presentation theme will be done the same as a song or scripture theme, but you will need to either choose the Master slide theme that will affect all slides or choose the specific content slide you want to make changes to. When editing a song, scripture, or presentation, in the Editor's main toolbar you'll see a Theme drop-down button. Click this button and select an existing theme to apply its layout and formatting to the song, scripture, or presentation you're working on. You may also drag-and-drop a theme onto a song, scripture or presentation in the schedule from the respective Themes Area. When editing a Presentation, you can select the type of theme you want to use for an individual slide by clicking the Theme button on the toolbar and then hover over the selected theme and click the type of theme you want that slide to use. If you add a new slide to your presentation and it shows up as a Title & Content slide, but you want it to be a Content Only slide, make sure the slide is selected on the left, under the Words or Slides tab, and click Theme on the toolbar, then hover over the selected theme and click on Content Only. The selected slide will change to that theme.